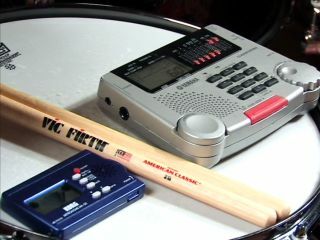 Drum basics: Why use a metronome? A metronome is a time keeping device that emits a regular pulse or ‘click´, where the tempo can be adjusted. In this video lesson, MusicRadar shows you why the metronome is so important for drummers. Playing along with a metronome is an essential skill to learn for any musician. While the click can be off-putting at first, you´ll notice your playing become tighter and more in time with even a small amount of practice. The metronome is also a key tool when learning to increase your speed. Start the metronome off slow at first and play along, then very gradually increase the tempo. Make sure you are playing perfectly at each speed before speeding up, however, as rushing the tempo increases will result in sloppy playing. Practicing with a metronome will also improve your playing even after the headphones are off and you´re playing without one. After practicing with a metronome you´ll have a better feel for the tempo of a track, and the more you practice along to the click, the better your time keeping will become when you´re playing without it - another skill drummers should master. For more drum basics tutorials, check out our lessons on matched grip, stretching and bass drum pedal technique.